Old Testament Israelite religion, as all fair-minded, non-fundies know, was just another ancient near eastern Semitic religion. Don't let the fact that it caught on and stuck around fool you: OT Israel borrowed her creation myth, her ritual system, her tripartite temples, and even some of her Scriptures themselves from Egypt and Canaan. This silly idea of a uniquely revealed religion is for those folks who have naively left their brains back in the days before we did real science and history. Biblical religion is myth, just like the rest of 'em. So says most of the scholarship on the OT and the Ancient Near Eastern world from the last fifty or so years. Which makes John Oswalt wonder: since for a long time even liberal scholars agreed that Israelite religion was mostly unique (even if it was wrong about God and the world), why this recent shift? And more importantly, is this newer wave of scholarly consensus correct? Does or does not the Bible present a religion that is essentially similar to or different than other ANE religions? This is the question that drives The Bible Among the Myths (which by the way should be re-titled "The Old Testament Among the Myths" - but Dr. Oswalt is an OT scholar, so we'll give him a break). Oswalt's answer is that despite undeniable ritual similarities, at its core OT religion rests on a fundamentally different worldview than do other pagan religions. Whereas all truly "mythic" thinking relies on a worldview of continuity (i.e. all things that exist are part of each other so that there are no distinctions between deity, humanity, and nature- everything is "continuous"), OT religion is built on transcendance (i.e. deity, nature, and humanity are not all parts of each other and God exists outside of, above, and in control of all time and space). This is the central claim of the book. And it is a claim that Oswalt makes successfully. The tricky thing about this argument is that, as Oswalt well recognizes, there really is considerable surface similarity between OT Israelite religion and the surrounding paganism. Thus the task becomes to show how these similarities are indeed only surface and not essential. Oswalt is effective on this point, and concludes by arguing that since the Bible is indeed totally unique, it is best to believe the OT witness that God had revealed it. How else do we explain the appearance of such thinking? 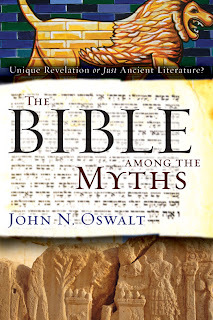 Since The Bible Among the Myths is mostly a book about backgrounds, one of Oswalt's more impressive accomplishments is his consistent eye to both theology and modern cultural relevance. I often found myself thinking not only about what the Bible says God must be like, but really and truly who God is relative to our world still. So, for example, anyone who reads this book will have a much fuller understanding of the kind of thinking that drives paganism of all sorts, whether it is ancient Ugaritic religion, established Hinduism or sloppy American New Ageism. And yet I also had one major frustration with this book. Oswalt emphasizes the line that separates humanity and deity transcendance (and thus in biblical religion). Since the fundamental claim is that these two are distinct and that God is therefore a person, not simply a shared part of the stuff of existence, Oswalt emphasizes God as a First Cause who then lets humans make real decisions instead of manipulating them. But the more Oswalt emphasizes this, the more it starts to sound like Deism. If humans are so irreproachably free, does God actually come to interact with his creation at all? And if he does, then how does he preserve humanity's total freedom in the process? The answer is that he doesn't! It is too apparent from too many OT texts that God, at least at times, violates human volition. Calvinists and Arminians both believe this (only Open Theists do not) and it needn't compromise transcendance. Oswalt returns to this poor point enough times that one even wonders if there is any aim secondarily at theological argument-winning. In any case, Oswalt seems to have tried to bail out God and his Book more than they need to be at this point. Still, I recommend The Bible Among the Myths with only limitied reservation. It is a useful introduction to the surrounding issues and a solid defense of the one at hand. I should warn that at times there is some theo-historical jargon to deal with that is a bit technical. This will be difficult for the least experienced readers. But most should be able to wade through it and get Oswalt's central point, which is one well worth making and knowing. I've recently started studying Genesis in preparation for teaching on the Patriarchs at church. One resounding theme from the four commentaries I have are the striking similarities between Genesis' ante-deluvian stories and other ANE myths. The skeptics conslusion is either copycate or reinforement of the untruth of all of it. the faithful conclusion is either the reality of it all, with the Genesis record being only ture version through nd through, or an example of God using the common notions and ideas of hist time, and having Moses (or author/editors) retell the them with a true theology as opposed to the error of the other ANE beliefs. Interesting stuff. The attitude you speak of doesn't go back 50 years, more like 150 years. And Oswalt is not the first to argue like that. One of the problems is the presuppositions with which moderns approach myth, and perhaps one can be postmodern about it too, and say that they way they approach the Bible and myth tells us more about the scholars and their presuppositions than it tells us about the Bible itself.